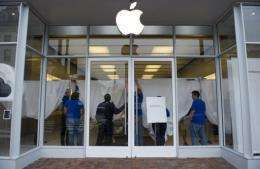 A security officer stands guard as employees construct a veil at a closed Apple store in Washington, DC. Steve Jobs was honored online and off Wednesday as tributes poured into a memorial website set up by Apple and the company's shops closed temporarily for workers to mourn his loss. Steve Jobs was honored online and off Wednesday as tributes poured into a memorial website set up by Apple and the company's shops closed temporarily for workers to mourn his loss. Doors were locked and curtains drawn at Apple Stores to allow employees in retail shops to tune into a private ceremony being held in an amphitheater at the company's headquarters in the Northern California city of Cupertino. Meanwhile, the world was given an online outlet for its grief at a "Remembering Steve" website at apple.com/stevejobs/. "Over a million people from all over the world have shared their memories, thoughts, and feelings about Steve," a message at the website said. "One thing they all have in common -- from personal friends to colleagues to owners of Apple products -- is how they've been touched by his passion and creativity." Comments and condolences received at a rememberingsteve@apple.com email address streamed onto the web page. "I am 17, and growing up watching every keynote presentation by the man in the black turtleneck was foundational to me," one message read. "His vision has done the better part of defining the Millennial (generation's) lifestyle, and I'm proud to say I am heavily influenced by Apple," the teenager added. "Everything about the company has inspired my philosophy on technology, and guaranteed Steve Jobs's methods will continue to be a driving force for me until, and beyond the day when I start my first company." Celebrities and Silicon Valley nobility paid tribute to the revered Apple co-founder on Sunday at a private memorial service held under tight security at Stanford University. The list of those invited to the memorial for Jobs -- who died on October 5 from cancer at the age of 56 -- reportedly included former US president Bill Clinton along with film and music stars, and founders of top Internet firms.